The Sea-to-sky highway, Highway 99 north from Vancouver, is the main route to the Olympic skiing centre at Whistler. 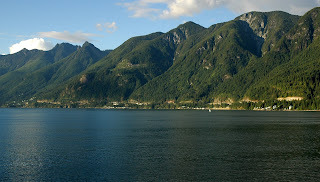 After passing the ferry terminal at Horseshoe Bay, the road hugs the coastline of Howe Sound all the way to Squamish. This is the view you get as you leave Horseshoe Bay on the ferry to Nanaimo on Vancouver Island, or to the Sunshine Coast. You can see the line of the road just above the water. The mountains rise up here towards Cypress Mountain, and further along towards the Lions, the iconic twin peaks that dominate the northern skyline in the city of Vancouver. Driving along the Sea-to-Sky can be breathtaking on a fine day, but for me nothing can beat standing on the top deck of the Langdale ferry as it passes Bowen Island and crosses Howe Sound. Even on a rainy day with limited visibility, the shadowy hulks of the islands and mountains have an awesome magic of their own.